Is your track day rain or shine? No worries, our road race rain top and bottoms offer a slim fit that will keep you dry in the rain and keep flapping at a minimum. An ergonomic fit fits speed humps and allows knee sliders to still be utilized. • (RR) material with taped and sealed seams. 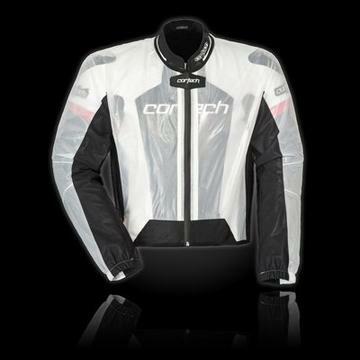 • Stretch panels through the arms, back shoulder and sides ensure a snug fit at speed. • Bib-Style fit with hook and loop fasteners running through the crotch and attaching to the front of the jacket. • Elastic sleeve cuff ensures a snug fit on any size suit sleeve. • Back of RR jacket is cut to fit a wide range of speed humps and specifically any Cortech speed hump.